Dr. Yew San Hor (right) with senior Yunsheng Qiu. Dr. Yew San Hor (left) with senior Yunsheng Qiu. 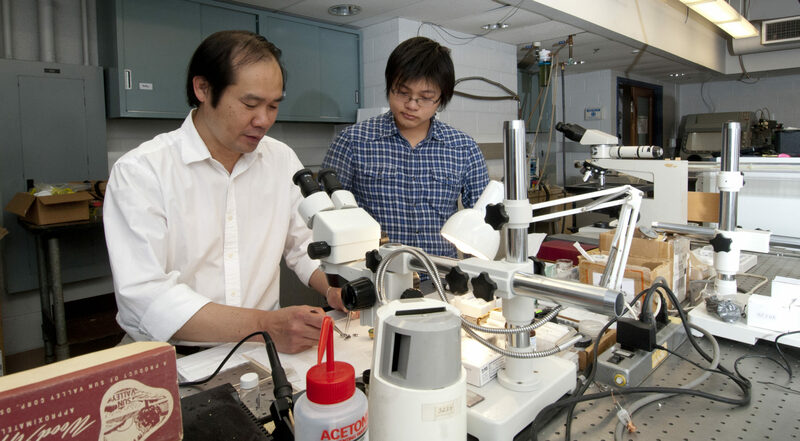 Dr. Yew San Hor, assistant professor of physics at Missouri University of Science and Technology, recently received the National Science Foundation’s most prestigious award for young faculty members for his condensed matter research and physics education and outreach. A member of the Missouri S&T faculty since 2010, Hor will use the CAREER Award funding to continue his research on growing new topological insulator and superconductor crystals and exploring the surfaces of the topological insulators (TIs). TI surfaces contain electrons with unusual spin transport properties that flow without dissipating, while the interior of the material prevents the flow. Coupled with a superconductor, the TI could help create fault-tolerant quantum computers. According to Hor, condensed matter and particle physicists believe the study of TIs will help in the search for Majorana fermions, which could be key to solving quantum computing applications. The research might also help to confirm the existence of axions, hypothetical particles that may provide clues to the mystery of dark matter in the universe. Hor will also continue to develop a course that debuted last spring at Missouri S&T. The course integrates basic concepts in solid state physics with experimental techniques in condensed matter physics. In addition, he will create a program targeted to local K-12 students. Both will incorporate 3-D animation developed on campus to help diverse audiences easily grasp physics concepts. Hor will receive $538,000 in CAREER funding over five years to continue his research. The award took effect on April 15, 2013.